The Ellis 20’s Semi-displacement Downeast Hull was designed by the late Ralph Ellis in the 1970’s and is still being built by Ellis Boat Company today under the leadership of Don Ellis, Ralph’s son. 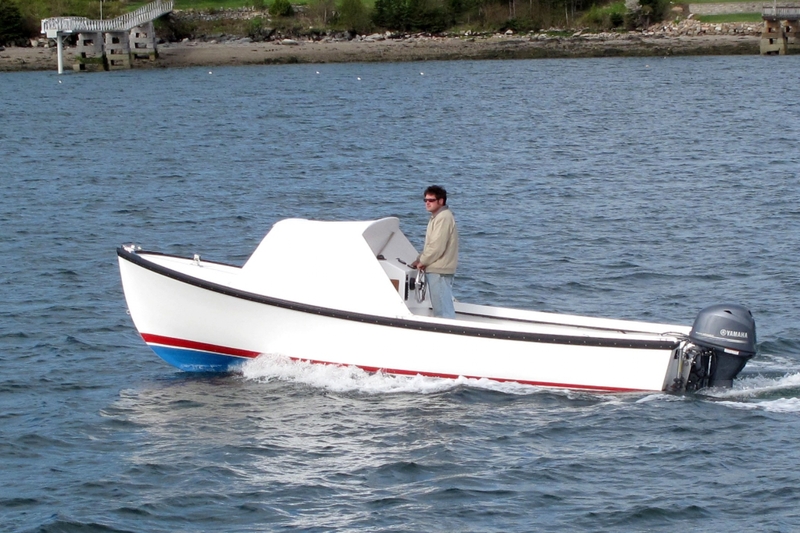 Ralph’s timeless Ellis 20 design has proven to be fast, fuel-efficient, and seaworthy. Reaching top speeds of 30 mph with a 70-hp outboard engine, the Ellis 20 will take you to your favorite fishing area or picnic destination safe and sound without needing to fill up with fuel in every harbor on the way. She will tow water skiers at an exhilarating speed or get you to your favorite fishing area and back with ease. The large cockpit makes an ideal fishing platform. The construction is of hand laid-up fiberglass to very strict standards which produces a strong hull with a beautiful finish. The self-bailing cockpit and built in flotation make this boat virtually unsinkable. If you’ve been searching for a quality boat for recreational use, fishing, or commuting to the islands, you needn’t look any further!